Caliban's Kitchen | Rants, reviews, and resources to help sustain sustainable eating. Last week John sent me a photo (see below) from home. 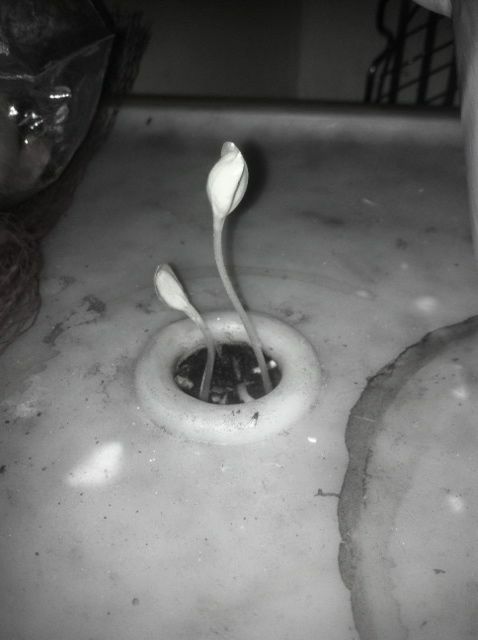 A virile green shoot had burst through the tiny portal in my once-Ikea, toy bin now homemade kitchen composter. When I got home and lifted the lid, I saw that it wasn’t alone. In addition to my family of fruit flies (which are thankfully dying down as the weather gets colder) I also had a seedling farm. I wondered what I could be growing? Cantaloupe? Acorn Squash? 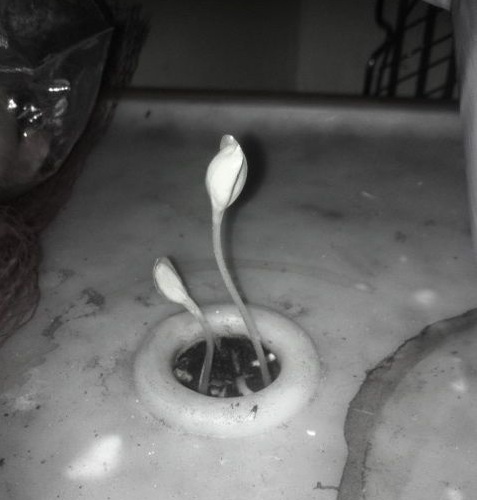 Baby apple tree? Green pepper? I have wanted to add peppers to my indoor windowsill garden. Currently the garden is bursting with tomatoes and basil and I think a spicy jalapeno plant might be a nice and doable addition. The compost is pretty mature. As I dug around I thought about how some life is desperate to continue, while other seeds and peels happily rot and return to the earth. The compost felt clumpy like clay, with a few sharp eggshells cutting through. 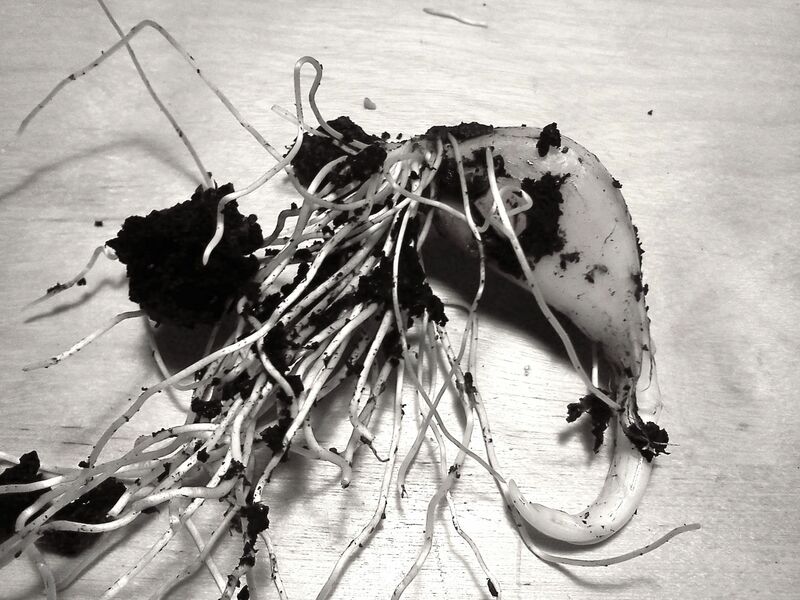 It’s true; I inadvertently killed a few little green sprouts, but managed to extract one or two in tact. I replanted them with the herbs in the living room. It wonder if they will take. And if they do, what will the become? I guess time will tell. In the process of my seedling excavation, I discovered the above treasure –– an errant whole clove of garlic that had been tossed and was clearly thriving. If I never mentioned it, I don’t just love garlic, I’m a little in love with it. If I don’t have it, I crave it. But I had never thought about growing it. Until my compost bin served me this little offering. I carefully extracted the garlic from the rest of the stuff. I re-potted the small, gnarly and tentacled thing in my hanging basket that had once held baby lettuce. According to a botanist friend, garlic does not need that much room. But in case, the Internet is right and it needs more room, the pot is pretty deep. Of course, it will take 6 months or so for me to find out if it will work, since garlic has a long maturation period. But I’m keeping my fingers crossed. Because if I could grow garlic and tomatoes in my living room, I would really be a happy renter. I wish you could smell my house right now. The air is pungent with that unmistakable smell of – bread. My mouth is watering even as I write this. Today is Yom Kippor, a day of fasting. In truth it is not the only Jewish fast day but it is the most known one among American Jews. The fast ends at sundown with a traditional dairy meal. Kosher Jews don’t eat milk and meat at the same time. So by dairy, I mean food that is not meat. And for many of us that means a spread built around bagels. It’s always boggled my mind how bread was invented. Who thought of taking yeast, grinding it up letting it rise and punching it down? But with bagels it’s even more baffling. Who thought of boiling the bread before you bake it? Probably someone who was in a hurry to eat. Bagels, only have one real rising and then after a minute of boiling, they only need to bake for about 25 minutes. Bagels, like hot sauce, are one of those food items that seems to have sprung up magically from the store or in this case, bakery shelves. I’ve never heard of anyone baking them from scratch. And I had it in my mind that it would be complicated and time-consuming. Actually it wasn’t. It took about as much time as it might take me to make dinner, excluding the hour when I left the dough to rise. It’s not something you would want to tackle on a work day, but even on a Sunday morning, you could conceivably make home-made bagels in time for an 11 am brunch without getting up at the crack of dawn. Ironically, even though I have not been working, I have not been baking very much. My anxiety has been filling up all the extra spaces and I’ve felt like I have had less time to write this blog and document how I’ve been managing to keep up sustainable practices like baking. Lately the choices that seemed difficult before, to buy the more expensive local or non-industrial foods, now seem irresponsible. So the new question becomes, can I sustain sustainability on a much more limited income. In the next few weeks I want to start really looking at what I buy and how much it costs. 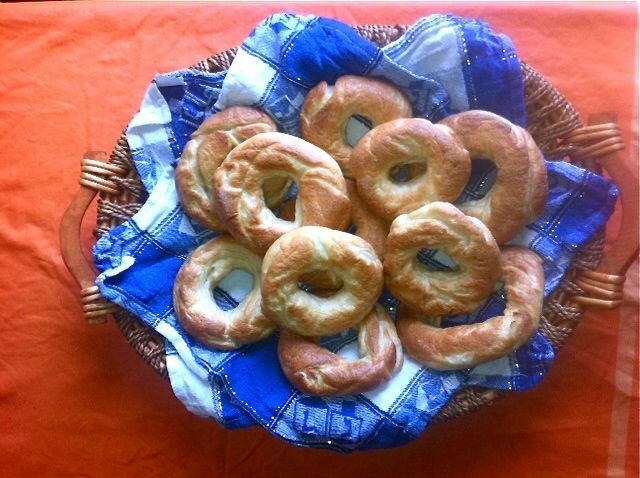 Home-made bagels, actually are an affordable alternative to the store-bought variety. Compare 7$ a dozen which is the amazing Fairways price, to probably under a dollar. The recipe I used called for 3 cups of flour — a pound of King Arthur Flour is only around $4. I used the recipe for Les Bagels d Jo Goldenberg which has been reprinted here. The technique they use is to make a ball, punch a hole in the middle and then roll the ring of dough into a bagel shape. I think it worked pretty well. This video says to roll a coil and tie it. We tried one and it didn’t quite work. But perhaps with practice it might not be a bad way to do it. This guy certainly is fast. The ones that I rolled to be a bit on the thin taste more like sweet Montreal bagels (traditionally cooked in a brick oven) — more delicate and not as doughy as traditional New York bagels. Of course, the bagels I made are not whole wheat. I need to find a whole wheat recipe. But now that I see how doable it is, I will. P.S. – Next up on baking challenges. How to make English muffins. Right now Z is eating them instead of hamburger buns. They are expensive, make garbage (bag and box) and are probably easy to make. At least compared to a bagel right? Is there something called Bloggers block. If there is I’ve had it. I’ve been whirling in circles, writing and deleting blog posts in my head and never quite making it to the computer to get anything down. It’s partly because I’m not sure what I have to say. Because I’ve been having a hard time to stay true to local, local, local, even in the middle of the summer. For example, last week I bought eggplant from a street vendor on St. Nicholas Avenue. I have no idea where it came from. I have no idea if it was local or organic. But it looked really nice. It was there and it was $1/lb. I felt like a bit like a renegade. I also bought avocados, which are never local. I know, I’m a real rebel. In case you didn’t notice. I’ve taken a tiny break from blogging. In fact, I noticed it’s been more than a month since my last post. I’ve been doing more or less what I have come to do – my sustainable practice – but I’ve been less than perfect. I’ve eaten a lot more take out than I should have which has made garbage. I haven’t been reading as much and I’ve been more interested in writing about other things. It’s hard to decide what to share in the blog and what to keep private. Even though I know most of my readers are actually people I know, the open conversation when it comes to more personal matters makes me a bit squeamish. I guess I’m showing my age. In a post-everything world, nobody really cares. But I do. So, the reason I stopped posting is pretty much economic. I left my job. It was time and I am glad to be moving on to new opportunities, but still, it was a shake up. And without the security of a paycheck, it has really made me think twice about the expense of organic and local food. Which brings me back to my eggplant and avocados on St. Nicholas Avenue. Think twice does not mean abandon. Because the truth of the matter is that I love going to the farmers market, meeting farmers and getting tips. We have lost a lot of our know-how when it comes to cooking and sustaining ourselves. But, as I’ve been spending more time looking for a job, I’ve had even less time to beef up on the latest. It’s another reason behind my blogger’s block. Still, the fact is, I’m still composting, cooking from scratch and more or less buying local. Writing about it, helps me remember, that it’s worth the trouble. Most people think corn in the husk keeps the corn fresher. 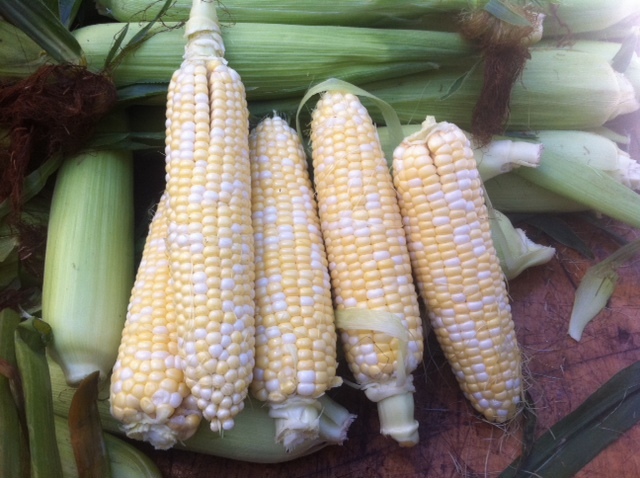 But according to a farmer at the Tuesday market, it’s better to husk the corn, put it in a Ziploc bag and store it in the fridge. She said husking delays the sugar breaking down and keeps the corn fresher and sweeter. I can’t seem to verify this on the Internet – I’m getting conflicting opinions. All I know is that I followed her advice, husked the corn on Tuesday, ate in on Thursday and it was pretty freakin’ good. To husk or not to husk? Any other opinions out there?